Welcome to Make It Monday with Kraft Outlet. Use this week's "Anything but a Card", theme to inspire you to create your project and then link it up at the bottom of this post before 6:00 p.m. (Eastern Time) on Sunday February 10 , 2013. Remember your projects MUST include the use of Kraft cardstock and/or items that can be purchased at Kraft Outlet! Also, all of our followers who participant in our challenges this month have a chance to be featured on our "Feature Me Fridays" posts as well as be entered to win a $15.00 Kraft Outlet Store Voucher! The more challenges you enter this month, the more chances you have to win! Jan chose a tag for the "Anything But a Card" challenge, for no reason except tags are always her first love ! Jan began with a very large tag, to which she adhered some design paper and this very cool Old Newspaper Washi tape ! A Large Manila Shipping tag was embossed, inked, sprayed, backed with some Kraft and Black Cardstock, and the same cardstock torn to make a pocket on top and stapled to the first tag, leaving room for a pocket. An "open this" sticker was adhered to the striped pocket. A reinforcement sticker was adhered to the largest tag, threaded with ribbon and some Earthy Hemp cord, along with an alarm clock charm. Inserted into the two pockets are a Small Kraft Shipping tag, finished with some Black burlap ribbon. Both the Journal ticket and the small tag have rubbing sentiments from the same package. Check out that little mustache brad! Everything was finished off with inking, and a teeny paper clip. Stop by and say hello at Jan's blog, chai tea 'n me ! For today's "Anything But A Card" challenge, designer Tammy created some delicious Valentine Smores treats. 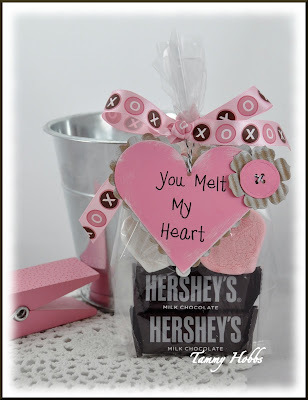 She started by die-cutting 6 scalloped hearts from Lunch Bag Kraft Text Paper onto which she layered 6 pink hearts with the sentiment. Using Lunch Bag Kraft, she die-cut 6 flowers and ran it through her crimper adding die-cut buttons to the center with Black Baker's Twine and assembled the tags. A small hole was punched in the center of the heart onto which Black Baker's Twine was used to tie the goodies together. 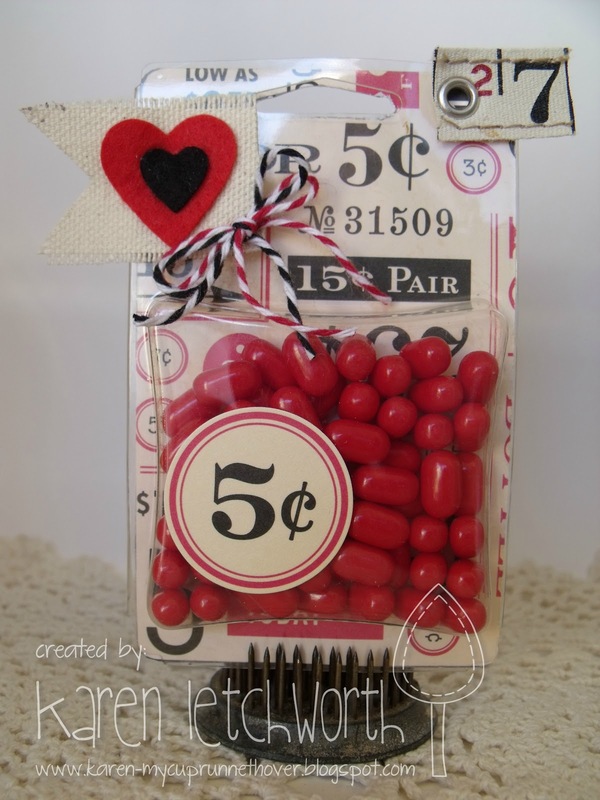 To tie in the Valentine theme, Tammy used some xoxo ribbon she had in her stash to create a pretty bow at the top. These are sure to bring smiles to some little faces! Please visit Tammy's blog, Creating Somewhere Under The Sun for additional information! For today's 'Anything But a Card' challenge, Debbie created a pretty little wrapper to go over a sleeve of instant flavored coffees - a perfect little gift-on-the-go! To begin, Debbie die cut a doilie shape using some Lunch Bag Kraft Card Stock and wrapped it over the top of the coffee sleeve. Next Debbie adhered a crochet doilie over the paper doilie and secured them both onto the coffee sleeve with a Tiny Black Wooden Clothespin. Debbie created a pretty bloom by wrapping some Ruler Twill Ribbon around and twisting as she went along. Two sweet leaves were hand cut from some Chalk Board Paper and adhered to the bloom. A pennant was created using a piece of Banner Chipboard and a Flag Banner Sticker onto which Debbie stamped 'Enjoy' from the Little Wishes stamp set. The pennant was added to a Memo Pin and then adhered to the nosegay. Last, Debbie stamped 'Hello Friend' onto a Round Metal Edge Grungy Prim Tag and adhered it to the nosegay. A couple of rusty jingle bells were tied onto the tag using some Natural Hemp Cording. Please visit Debbie's blog, Simple Treasures, to view additional pictures of today's project! For this week's challenge, "Anything But a Card", our Design Team Member, Karen Letchworth, wanted to help you be thrifty, and show you all how you can use the plastic packaging from many of the items you purchase to creative a little gift. 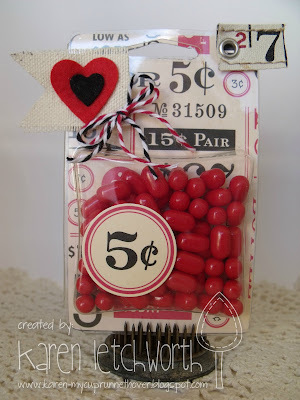 This little candy holder was made using the container from the Tim Holtz Ruler Ribbon available at The Kraft Outlet. Karen used to throw away all these little plastic containers until she learned what darling gifts can be created using them. This Tim Holtz Ruler Ribbon is, by itself, an AWESOME product. You can see a snippet of it in the upper right-hand corner, and Karen also used it in last week's "Seeing Red" Challenge. You simply take off the cardboard backing and trace it onto a piece of patterned paper, and this becomes your new backing. Next, Karen added a little canvas flag cut from a Mini Canvas Tag. She added a couple of felt hearts, some red and black Baker's Twine and added a sweet Tiny Wooden Clothespin as the finishing touch. One little box of Wild Cherry Tic-Tacs fit perfectly into the plastic container. This will now make a sweet little Valentine's gift. You can read more details about this project on Karen's blog, My Cup Runneth Over. Lovely one thank you girls.